2. Pre-trial conference: The pretrial conference will be scheduled within 4 - 6 weeks of the arraignment date. The pretrial conference is to ensure that you have all the information about your case; it is an opportunity to obtain additional information from the prosecutor and discuss possible resolution of the case. There may be more than one pretrial conference; in some cases, 2 or 3 pretrial hearings may be required as a result of delays from the district attorney's office in providing information. 3. Motion Hearing: The officer will testify at this hearing, as the aim is to limit the extent of evidence being used in the case against you. One possible motion is a motion to suppress evidence obtained as a result of the stop being in violation of your Constitutional rights under the Fourth Amendment and Article 14 of the Massachusetts State Constitution. The basis of this motion is that the officer did not have a legal basis to stop your vehicle under the Constitution. If this motion is successful, the case will get dismissed. Even if it is unsuccessful, the motion generally reveals valuable discovery as it provides a preview of the officer's testimony. A second type of motion is a motion to suppress statements obtained in violation of your Miranda Rights. This motion generally will not result in the dismissal of the case, but often strengths your defense if successful by precluding the Commonwealth from being able to offer into evidence statements either during the field sobriety tests or at booking that will help the Government's case. 4. 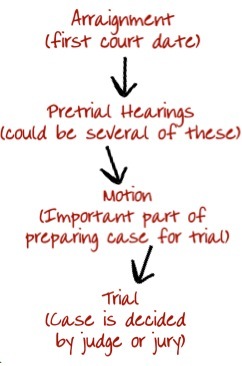 Trial: The next step is to set a trial date. In an OUI trial, the trial typically takes only one day and is before either a judge or a jury. Depending on the facts of the case and the judge, sometimes a bench trial offers a defendant a better opportunity to obtain an acquittal. Only after careful evaluation of all the evidence can this important decision be made as to whether to proceed with a trial before a jury or judge. One benefit of a having a DelSignore lawyer on your side is that they could work to preserve the evidence in a person’s case. Sometimes, evidence from is not kept and can even be erased. For example, video evidence can be crucial in cases and yet, there are police booking videos that are not always kept. An attorney should make sure any evidence is kept when the case starts because these cases come down to the fine details. It is important for attorneys to visit the scene of the incident, and to talk with the individual in order to understand the details of what happened. Afterwards, the lawyer will most likely be ready to try the case. Too often, people are urged to resolve cases quickly when the cases are very winnable. It is important to work with someone that is going to go over the report and who understands the strengths and weaknesses of the case and is able to present the case in the best way to a jury. The discovery process in OUI cases is mandated by statute. The Commonwealth or the District Attorney’s Office is required to provide any information, exculpatory or inculpatory, to the defendant. This means any 911 tapes, any statements by witnesses, any reports made by police officers, or booking videos. They are required to provide that to credible defense counsel. Anything that they intend to use at trial must be provided. Attorneys often begin the discovery process in Dedham OUI cases, as soon as they enter into the case. Typically, the Commonwealth will request a pretrial date and on that date they provide whatever discovery they have. Sometimes the District Attorney’s office will request a discovery in compliance date, which is a date that comes after the pretrial. If they have been unable to gather all of the evidence, they ask for this additional date to get all that together to provide to defense counsel. A defense attorney can file a rule 17 motion if there are documents such as cell phone records or medical records of someone involved that are not easily procured without an order from the court. Defense attorneys can do that as well. As long as the order is allowed by the judge, they can subpoena either medical records from another party that was involved or surveillance video. That can all be done through a motion to the court. As part of the discovery process in OUI cases, a defense attorney can request witness information, medical records from the accused. Most of the time, the original report will be provided to the court and to the District Attorney’s Office and then upon request, they will provide additional discovery, such as the booking video or the 911 call. At that point, the District Attorney will provide it to the defense counsel. If you were arrested for OUI in Massachusetts, you can set up an appointment to discuss your case at 781-686-5924. Alternatively, download a copy of Michael DelSignore’s book designed to help you further understand Massachusetts OUI laws. If you were charged with OUI and have questions about the court process and the pending charge against you, feel free to contact us today. Attorney DelSignore can be reached anytime, by phone call or by text, at (781) 686-5924. If you prefer to text, please make sure to include your name in the text. To learn more about accepting a continuance without a finding on an OUI case, or to learn more about some of the defenses available to your case when you take the breath test, visit our website toady.